John Bogle, founder of The Vanguard Group, has long been a proponent of buy-and-hold, passive index investing. Vanguard offers some of the cheapest index investing around having started an S&P 500 investable product back in the early 1980s. 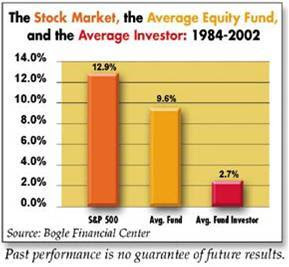 Based on a historical study from 1984 to 2002 conducted by the Bogle Financial Markets Research Center, average investors have performed dismally versus simple passive index investing. Average investors, even while believing they can withstand 20% drawdowns, or 40% drawdowns, and believing they will not buy into hype, have a terrible tendency to sell lows and buy highs. These emotional investment decisions combined with high fees from over-trading result in awful long-term returns. The vast majority of investors are best-served by holding diversified ETFs with broad exposure. Sure, they will not do well in times of economic contraction but the long-term trend of human innovation is consistent and economies will tend to grow over time. Even the professionals, on average, underperform the index. It is a fact that 80% of mutual fund managers underperform the index in any given year. Add the fact that mutual fund investors consistently chase performance by investing in "hot" funds and selling "cold" funds, actual investor performance is even worse. Use a manager if you know nothing and have no interest learning. Use a manager if you have extra needs like detailed accounting, tax advisory, etc. But, on the whole, the average investor should stop trying to beat the market and simply increase their savings as a way to assure enough money for retirement.